Nevada is 110,540 square miles: 485 miles long, 315 miles wide, and ranks as the seventh largest state in the United States. It became a U.S. territory on March 2nd, 1861 and became the 36th state on October 31st, 1864. 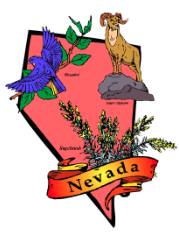 Nevada consists of 16 counties. State Gemstone – Black Fire Opal can be found in only one place on the North American continent, Virgin Valley, Nevada. provides throughout Nevada. It’s most famous locations in the state are in Red Rock Canyon and the Valley of Fire. State Grass – Indian Rye Grass (Orzopsis hymenoides), once a staple food source for Nevada’s Native Americans. This grass has the ability to re-seed itself and is ideal for planting in areas damaged by fire or overgrazing. State Fossil - The Ichthyosaur (Shonisaurus) was designated in 1977 as the state fossil. Nevada has the only complete skeleton. This extinct marine reptile measures 55 feet. Las Vegas climate is classified as arid (dry). It averages 294 days of Sunshine per year (211 clear days, 83 partly cloudy). Highs of 105° are common from May to September, with several days exceeding 115°. The average annual rainfall is 4.13 inches. Humidity stays around 29%. Students and active duty personnel (including dependents) do not need to register their vehicles or acquire a new license in Nevada as long as the individual is not employed in the State of Nevada. Vehicles must be currently registered with the home state of valid insurance and driver’s license. Out-of-state drivers and vehicle registrations can be used by new residences for up to 30 days or before the prior items expire, whichever comes first. At any time during that 30 days, they may be turned in to the DMV for Nevada documents. Nevada law requires motorists to notify DMV of a change of address within 30 days of the move. Keeping your address current is important so they can send renewal notices in the mail. Certificate of Title if ownership is changing. If not changing ownership, the owner has the option of retaining the out-of-state title.